Today, January 25, dozens of members of Mayors Against LGBT Discrimination gathered in Washington, D.C. for the 2018 Meeting of the coalition, which coincides with the coalition’s 1-year anniversary and the U.S. Conference of Mayors Winter Meeting. The meeting this morning took place at Holland & Knight in Washington, D.C. For more than a year Holland & Knight has been a tremendous partner in the work to elevate voices of the many mayors nationwide who support full equal treatment for LGBTQ Americans. 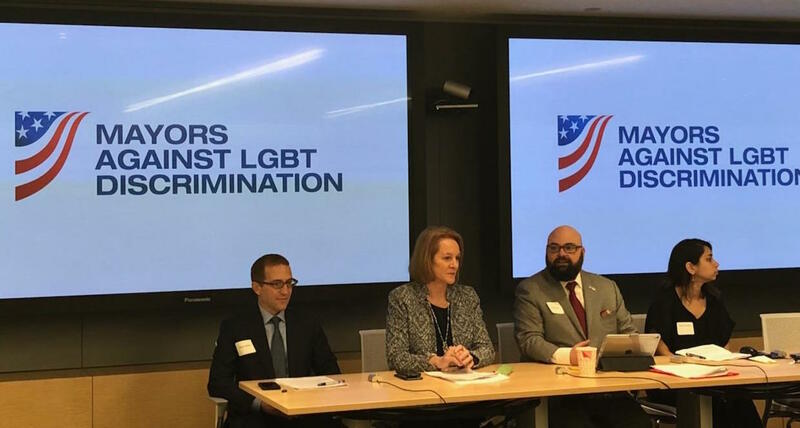 The event included several experts providing policy and litigation updates on issues affecting the LGBT community, including the impacts of the Trump Administration’s policies, local legislative developments, and the potential effects of litigation pending before federal courts, including the possible outcomes of the Masterpiece Cakeshop case. (L-R): Freedom for All Americans Senior Director of Public Education Rodrigo Heng-Lehtinen with Philadelphia Mayor Jim Kenney; Mayor Patrick L. Wojahn of College Park, MD, Mayor Mike Duggan of Detroit, MI, and Mayor Christopher Cabaldon of West Sacramento, CA; Mayor Jenny Durkan of Seattle, WA with Mayor Duggan of Detroit; the panel at the Mayors Against LGBT Discrimination meeting. Speakers included Mayor Jim Kenney of Philadelphia, PA and Mayor Jenny Durkan of Seattle, WA, the latest mayor to become a co-chair of the coalition. Mayor Durkan is the first openly lesbian mayor of Seattle and the first woman to be elected mayor in nearly 100 years. A short panel discussion was hosted by Freedom for All Americans CEO Masen Davis, and additional policy updates were delivered by GLSEN State and District Policy Manager Sarah Munshi, and ACLU Director of Program on Freedom of Religion and Belief Daniel Mach. Participants also observed a moment of silence for former mayor of San Francisco Ed Lee, founder and co-chair of the coalition who passed away in December. 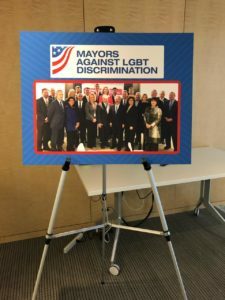 Mayors Against LGBT Discrimination is a first-of-its-kind nonpartisan coalition that launched in January 2017. Since its inception, mayors have participated in three in-person briefings; published press statements and op-eds in support of LGBT nondiscrimination protections in places such as Pennsylvania, Wisconsin, Texas, and nationwide; signed onto friend-of-the-court briefs in key court cases such as the Masterpiece Cakeshop case pending before the Supreme Court, and taken additional actions to advance equal treatment. The coalition is a program of Freedom for All Americans, the campaign to win comprehensive LGBT nondiscrimination protections nationwide. For the full list of participating mayors, visit www.mayorsagainstlgbtdiscrimination.org.